— I recently read Noah’s Garden by Sara Stein in which she describes her journey from managing her New England garden according to an aesthetic of visual control and order to a plate heaped with questions and contradictions about how we and our gardens function in the larger world that we live in. She reveals how enormously, unthinkably complex the ecosystems are that function around us; and how thoroughly we have disrupted them. The book is also full of suggestions and optimism for how we all could make different small decisions in our back yards that could have great impact. As I am a New England transplant, this book gave me for the first time some understanding of and feeling for the landscape I live in. It also led me to thinking about art in relation to landscape. My work is always, at least in part about landscape and it’s always about picture making. Picture making, I believe grows from windows in architecture, and also from our marking of boundaries in relation to property ownership – usually rectangular parcels of land that we “compose” gardens and houses within. In both cases, but especially in relationship to architecture and the white cube exhibition space there is a remove from the wildness of nature that is achieved though our formal devices. 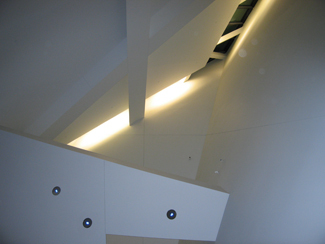 I was recently in Denver looking at the Denver Art Museum designed by Daniel Liebeskind. I expected to hate the building – but I didn’t. I found it quite beautiful especially in terms of how it makes space for the public to be in the building looking at art. It is a building for people. 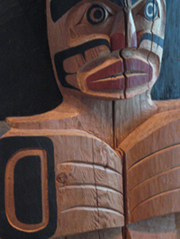 I grew up in Vancouver where I was from childhood quite taken with the totem poles of the northwest coast Indian people. Some of this work was in the collection of the Denver Art Museum. It struck me that Liebeskinds’ architecture makes an effort to find another kind of space to show art in. The totem poles are very involved in picture making. They are “pictorial.” But they were intended to exist outside, among trees. They don’t propose the same kind of division between themselves and the outside world as my work does. Instead of proposing a look through a window they incorporate a stylization that points to the shape of the eye. Perhaps they propose that the eye is the frame that forms our capacity to make “pictures” in mind. Carving out space for picture making on totem poles, in gardens, in paintings, or in architecture seem all related. The space drawn out as separate acts as metaphor for the internal space of mind and feeling, and in that space we can struggle to make sense of living. 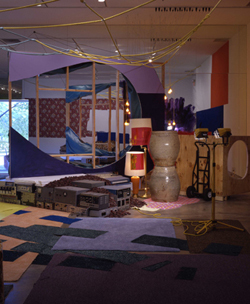 Jessica Stockholder received her B.F.A. from the University of Victoria in Canada in 1982 and her M.F.A. from Yale in 1985. She has exhibited widely in North America and Europe, at such venues as the Dia Center for the Arts and the Centre Pompidou in Paris. Her work is represented in various collections including the Art Institute of Chicago, the Whitney Museum of American Art, LACMA, The Vancouver Art Gallery, and the Stedelijk Museum in Amsterdam. Ms. Stockholder was appointed to the Yale faculty in 1999 and is currently professor and director of graduate studies in sculpture.